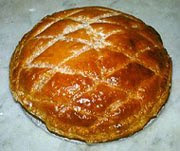 GALETTE DES ROIS (Gâteau Des Rois or Twelfth Night Cake), a marvelous tradition still alive in France. When I was a kid in Reims, the capital of the Champagne district, one of my favorite celebrations of the year was La Fête des Rois that was a joyous family affair taking place on January 6, the 12th day after Christmas, better known as Epiphanie. Epiphany is a commemoration of the day the three Rois Mages (the Magi Kings Balthazar, Melchior and Gaspard) visited the infant Jesus in his crib and brought him very rich presents. On that day my father used to buy a GALETTE DES ROIS in one of the best pastry shops of the town. After lunch we would watch without saying a word my mother cut that round golden-colored relatively thin cake in slices, wondering if the cutting knife would, by pure chance, hit the ‘’Fève’’ (the fava bean) hidden somewhere in the flaky buttery crust. 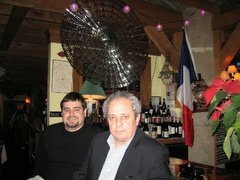 My father would serve Champagne, and I sometimes would be allowed to drink a few small sips when I became an adolescent. Everybody watched everybody to guess who had found the ‘’fève’’ that earlier in the century was actually a real bean, but after WWI it was progressively replaced by a tiny ceramic figurine representing either the baby Jesus or another animal or symbol of luck. The person who found the fève was proclaimed king or queen. He or she would put one of the 2 paper crowns which came with the galette, silver and golden, on their head and everybody lifted their glasses and cheered ''Vive le Roi'' or '' Vive la Reine''. But I remember that just after the end of WWII when I lived in the South of France the fève of the ‘’Gâteau des Rois’’, which was made of a brioche topped with candied fruit, was actually a real bean. In Northern France the crust of the cake itself is made of a flaky puff pastry coated with egg yolk, and the inside filling is a delicious ‘’frangipane’’, a very rich and creamy almond paste that is sometimes mixed with a sort of ‘’crème patissière’’. The way the galette or gâteau des Rois is prepared by the pastry chefs varies from one province to the other but the shape is always round. The ritual when I was very young consisted for either one of my younger brothers or my sister to go under the table or in a corner of the room so that he or she could not see the table and then tell my mother to which member of the family’s plate the slice she was cutting should go. Sometimes after a first round of slicing the fève could not be found and we had to eat a second portion, much smaller alas, to be able to name a king or a queen. Of course, we always tried to cheat and pretend that either we had the fève or that we had swallowed it by mistake in order to be declared king. It has been said that many years back the person who found the feve was supposed to buy the cake and the champagne for everybody the next year, and that soem in order to escape that obligation would swallow it. But the celebration of the Fête des Rois in France is an occasion for having a joyous and often quite boozy party in many offices and other work places, where men found this way to express an interest for a female co-worker by naming her their queen. In fact, for the last 20 years most pastry shops in Paris started to sell galettes des rois as early as January 2 and continued to sell them after January 6 to satisfy the demand of all these office parties. To the best of my knowledge, you find similar traditions in several Latin countries, such as Spain, Italy, Portugal, Greece, and Mexico, as well as in Belgium and the French-speaking part of Switzerland. Last night we found a very charming pastry shop called FRITZ PASTRY (at 1408 W. Diversey Pkwy in Chicago, tel: 773-857- 2989 mail: pastry@fritzpastry.com ) that makes a very good Galette des Rois called Epiphany Cake. It sells for 3 dollars a slice. Actually that shop is also a cozy and comfortable coffee-shop with a few tables where besides their cakes, brioches, macarons, very buttery croissants, tortes and fruit pies, you can also order quiches and savory pies, soups like bisques, and a few other daily specials, and good quality coffee and tea. The place is charming, relaxing, decorated with 2 beautiful old sepia photographs, one of them of the famous stairs of Montmartre. The young lady who was there to help us was most gracious. All the pastries we saw in the shop looked very tempting, and the air was filled with a very pleasant smell of mocha. Their rendition of the Galette des Rois was a very flaky, buttery, and rich piece of puff pastry that was not too sweet and had the right amount of good quality frangipane (almond paste- based filling). We loved it and will certainly return for more. The croissant we tasted was one of the best French croissants I have been able to find in Chicago over the last 40 years. My only concern was that it was almost too rich in butter to the point of being borderline “ too much”. I think that by making them a bit lighter and flakier would turn these very tasty croissants even better. In any case they are really good. The chef-owner is Nathaniel Meads whose resume includes prestigious Chicago restaurants such as TRU and EVEREST. Mix the egg with the almond paste until smooth and spread the mixture evenly on the prepared circle of pastry, leaving a border 1 1/2 inches wide all around. If you have a small porcelain figurine insert it into the almond mixture (you may also use a bean as the fève.